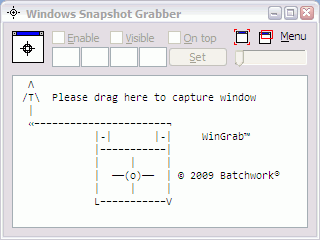 Windows Snapshot Grabber Window Snapshot Capture and Screen Capture. Capture Window and Set as Topmost/Enabled/Visible/Resize and Get a Window Snap. WinGrab get window's or control's details such as Style/ExStyle, Font and Color. And it can enable or disable a window or button or other control. Hide or set a window as transparent. Set a window as topmost. Resize a window or control for capture a snap. Especially WinGrab can capture a window snap with menus. WinGrab can capture a control snap also. WinGrab is very light and simply and user-friendly program. And it can remember all history of changed window. It can support task which can close some nag window or dialog automatically.